This past summer, the Entertainment Software Ratings Board (ESRB) celebrated its 15th birthday. I imagine the anniversary must have been met with a certain amount of relief from the organization's members and supporters. Because along with classifying game content and doling out the ratings you find on the vast majority of commercial videogames, the ESRB has spent the past 15 years in the eye of a storm that is only now showing signs of waning. Born out of the videogame violence controversies, the ESRB has spent its lifespan at the center of an epic tug-of-war between government and industry. And now that those old controversies finally appear to be fading, a whole new set of challenges has settled in for the long haul. 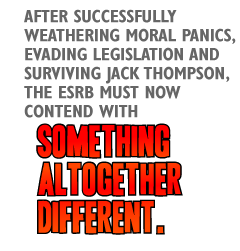 After successfully weathering moral panics, evading legislation and surviving Jack Thompson, the ESRB must now contend with something altogether different, and it might turn out to be its Achilles' heel. Years of sameness can be grueling, but it also breeds familiarity, even mastery. Change, on the other hand, brings the unexpected, demands new tricks and reveals weak points you never knew you had. In this case, the changes are multiple: converging technologies, dissolving monopolies and a Web 2.0-infused games culture that's going to require a lot more than the ESRB's current disclaimer of "Online Interactions Not Rated." The ESRB came out of a joint proposal by Sega and Nintendo as a way for the industry to avoid governmental regulation while assuaging societal anxieties about kids and videogames. Public outcry around the increasingly graphic depictions of violence found in games like Mortal Kombat led to a series of congressional hearings in 1992 and 1993 and the introduction of the Video Game Rating Act in 1994. The Act stipulated that unless the game industry established its own ratings and regulatory system, the government would step in and do it for them. This prompted the game industry to create the Interactive Digital Software Association (IDSA), which later changed its name to the Entertainment Software Association (or ESA). The ESRB soon followed, opening for business on September 1, 1994. The main objective of the ESRB was to provide an industry-driven game content classification system that would operate on a voluntary basis and enable cooperation between game developers, retailers and consumers. One of its founding principles, as well as a key argument for keeping the system voluntary, was the promise that by enabling them to make informed choices, the ESRB system put parents back ''in charge'' of their kids' media. For several years, however, a lack of enforceability translated into poor compliance rates among retailers. The government had given the FTC the role of official ESRB watchdog, and year after year their reports revealed the system's failure to significantly diminish children's access to restricted games. Studies found low levels of awareness of the ratings among parents, while T and M rated titles were often marketed directly to young children. All of this raised deep questions about the sincerity of the self-regulatory board and generated a ton of bad PR.